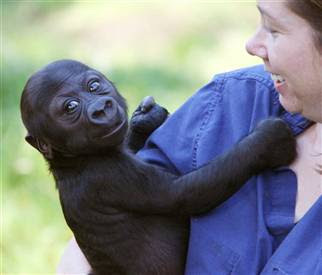 The father of a 3-month-old western lowland gorilla abandoned by its mother at the San Francisco Zoo has picked a handsome name for his son. Zookeepers on Wednesday set up five different melons in the father gorilla's enclosure, each one representing a different name. Oscar Jonesy, the father, chose the melon for "Hasani," which means "handsome" in Swahili. The zoo says Hasani has been under human care after his mother left their nest and refused to return to nurse. The zoo chose the five finalists for the name from 5,300 entries. The winning name was suggested by Amanda Verploeg of Oskaloosa, Iowa.